Heritage Elm Grove had nice, good-sized rooms, bathrooms, and nice fixtures. They also have room that can fit your own furniture. They have nice large closets. They have activity directors and they showed old movies. They play cards and dominoes. They have TV sets in the lobby area. Once in a while, they have Happy Hour every Friday. They sing a lot of old time songs from 40s up to the modern day stuff. They also have activities where people put out snacks. They also go on trips that you can sign up for, and they have transportation so you can get out once in a while. Hi, Lloyd. We're glad that you had such a positive experience at Heritage Elm Grove. We definitely do try to organize a wide range of activities and outings for our residents! Providing an active and welcoming environment for our residents and guests is very important to us. Thank you for sharing your experience! Happy Soon to be family! By Happy Soon to be family! I was greeted by their marketing director and she is a delight! I felt so comfortable talking to her. She has such a warm and compassionate heart. Very thorough tour. I have so many questions that are now answered. The staff was very friendly and the elderly living there looked happy. My mom is very social and I know that she will fit right in. The amount of activities on the calendar is unbelievable! Very pleased with Heritage in Elm Grove. I am excited to have my mother there. We are delighted that your tour of Heritage Elm Grove went so well! Providing a caring and active environment for our residents and guests is very important to us. Thank you for your comments! We wanted a higher level of care because my husband is unable to stand and walk. He needs more personal care and has mental health issues. Heritage of Elm Grove said they provide that, so that's where he's living. They have patios or little porches where people can go out. They're very patient and really work at trying to help people. He is extremely impressed with the food. He has a nice room with a little patio area. He's in a wheelchair, but he is able to go out there and sit in the sun almost daily. They have bingo, different card games, and a couple other things. It's expensive, but he's at a higher level. There are tiers, and based upon the tier that you're in, that's what you pay. They give a lot of mental support and training done by a nursing assistant. They have RNs, which I appreciate because my husband has some problems. They don't have outdoor activities, which I wish they would have. We are delighted that your husband has had such a positive experience at Heritage Elm Grove. Providing a caring and active environment for our residents is extremely important to us. We appreciate your comments! By A very happy daughter! Finding placement for my father was one of the biggest decisions I have ever needed to make. I went to several different places, but the one place that stood out to me was Heritage Senior Living. Their Admissions consultant was so welcoming and very flexible in meeting with me. I first toured with her on a Tuesday night. The place was beautiful and the people living there looked very happy! A gentleman was playing the piano for all of the seniors. Some were even dancing!!! I then asked if it would be alright to bring in my husband that same weekend. This consultant did not hesitate one bit. She was more than happy to show everything all over again just so that my husband could see it. I was impressed by the staff! Very knowledgeable! Very warm! Very Inviting! This made my decision rather easy! My father loves it there! Heritage was clean and warm, but a little dark. The person that assisted us was excellent. She was very knowledgeable, very friendly, very warm, and very helpful. The dining area looked very fine and clean. Heritage Elm Grove is beautiful and they talk a good game; however, the reality is that they are understaffed, over promise the level of care given and do not meet the basic needs of the residents. My mom has been a resident for 2 weeks and will be moving. They have not delivered medication on time, have repeatedly not responded to her emergency call button, have not cleaned her room and the staff treats her like a child ( on the verge of verbal abuse). DO NOT believe what they tell you when you visit. We thank you for your feedback and assure you that we take all concerns very seriously. We will be investigating these issues you have brought to our attention and want you to know that our main goal is to provide the highest level of care possible. If you would like to bring these concerns to us directly, we welcome you to contact the Community's Director at Heritage Elm Grove. I thought the Heritage of Elm Grove was very nice. The people there were very professional, and it's a brand new building, so obviously it's gorgeous. It just was a nice feeling when we walked in. Like I said, the building was brand new, so it was designed very nicely. The rooms are a decent size, and it really can get you a bedroom and a living area, which is what she wanted. It is a little crowded where the actual building is because there is a railroad track pretty close by, but they seem to have done a nice job with the outside landscaping, and they have a nice porch up on the second floor. We have eaten there three times now, and the food has been very good. The chef actually came out and asked us if everything was OK or if there was anything he could do that was different, so I was very impressed with that. They have two or three activity people, so we met them, and they seemed to be interested in what she likes to do and what her likes and dislikes are, so I felt that was very nice. They were offering cooking classes and a Catholic service every Friday, which is something that my grandma was very interested in. They had puzzle things, card games, and Bingo, and they just seem to have two or three activities every single day. They do have transportation for the residents. There is a grocery store within walking distance, and the Sunset Playhouse is also within walking distance -- like less than a block -- but they said that they provide transportation to the mall, which is two miles away. They have a good relationship with the churches and a couple other organizations right in the community, which I thought was nice, and I felt like I was part of the community. Heritage Elm Grove is a new building that just opened up in July. It was very nice and clean. They have pleasant dining rooms, a craft room, a pub, and games. Some people were in the room doing some exercises. The staff was helpful and knowledgeable about everything. Everything was brand new. Heritage Elm Grove was very nice. The people there seem to be fine, but it is hard to tell if you are just going through. I got to visit their dining area, and it is clean. It is new, very bright, and very nice. With a reassuring emergency call system and personalized call pendent, all the comforts of home get an added level of safety and security. Heritage Senior Living specializes in caring for the unique needs of residents with Alzheimer’s or other related dementias. Residents receive compassionate individualized care 24 hours a day. Health and wellness programs, personalized nutritional dining programs and medication monitoring are all handled by the caregivers that work closely with registered nurses and resident’s physicians. Memory Care in Elm Grove, Wisconsin features beautiful private accommodations within a safe secure environment. With a choice between furnished or unfurnished, apartments can be decorated to the resident’s wishes. Within each apartment you will find a private bath, walk-in shower, spacious closets and wall-to-wall carpeting. Residents are able to stroll throughout the uncomplicated building design, allowing them to continue with their ongoing daily routine while they maintain dignity and well-being. Memory Care residents get the safety and security they need from their community as well as the personalized medical care when necessary. Enhanced Assisted Living in Elm Grove, Wisconsin is available to seniors who require higher physical and medical care needs, yet do not require skilled nursing. Enhanced Assisted Living at Heritage is licensed as a Community Based Residential Facility (CBRF), and will offer private Apartments with a choice of studio, one, or two bedrooms. Services in Elm Grove’s Enhanced Assisted Living include but are not limited to extensive assistance with activities of daily living such as; bathing, dressing, grooming, and assistance with medication administration. Additional care is provided for those who extra need help with cueing for mealtime, directional assistance and participation in stimulating activities. Elm Grove’s Enhanced Assisted Living offers a higher staff to resident radio allowing more time for staff interaction with the resident. Three meals per day, specialized diets and snacks are provided. Heritage’s mission is to create vibrant communities that feel like home, provide quality care, and employ compassionate caregivers who treat our residents as if they were their own family. Heritage prides itself on being open and accepting to all our residents and their individual care needs. 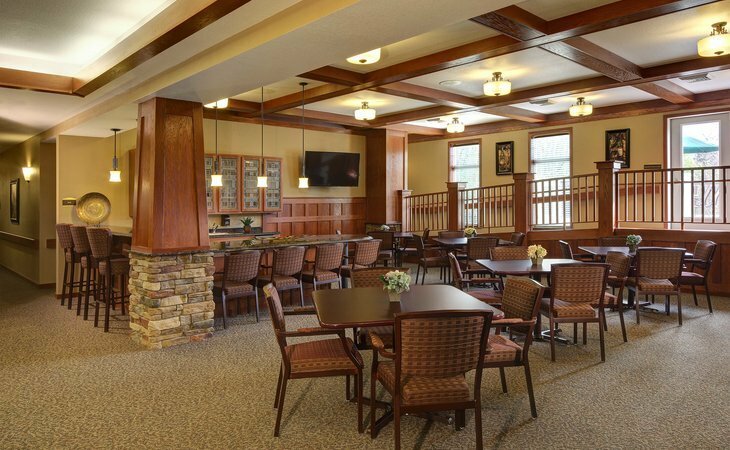 The commitment to provide excellent care, along with a comforting home-like setting, is what makes Heritage Senior Living the premiere senior housing communities in Wisconsin. What should caregivers and potential residents know about Heritage Elm Grove?